The effect of taxes on supply and demand - FreeEconHelp.com, Learning Economics... Solved! One form of government intervention is the introduction of taxes. Taxes are typically introduced to increase government revenue, but they also have the effect of raising the cost of goods and services to the consumer. Because of the increased cost, we generally see a reduction in the quantity of goods and services produced and consumed after the introduction of taxes. A common form of tax is a sales tax, which is added on to the price of a product and paid by the consumer. Another common type of tax is a VAT (value added tax) which is paid by the producer along their production chain. 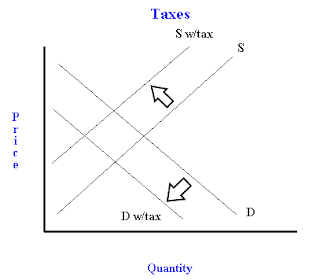 The sales tax on the consumer shifts the demand curve to the left, symbolizing a reduction in demand for the product because of the higher price. While demand for the product has not changed (all of the determinants of demand are the same), consumers are required to pay a higher price, which is why we see the new equilibrium point occurring at a higher price and lower quantity. The magnitude of the shift in the demand curve will be equal to the amount of the tax. This makes sense, because the change in demand is going to be equal to the change in price that is caused by the tax. The VAT on the suppliers will shift the supply curve to the left, symbolizing a reduction in supply (similar to firms facing higher input costs). While supply for the product has not changed (all of the determinants of supply are the same), producers incur higher cost, which is why we will see a new equilibrium point further up the demand curve at a higher price and lower quantity. Once again, the magnitude of the shift in the supply curve will be equal to the amount of the tax introduced by the government. Essentially, the firms are passing on the tax to the consumers in the same way they would pass on higher input costs. Another type of tax is a labor tax. This increases the price of labor to firms (because they have to pay the wage AND the tax) which will decrease employment and wages. The government should bring the good police about the tax system and it is good for the economy of the country but australianwritings assignment writing service provides amazing work. I agree with this points that government should to do the introduction of the tax and give the benefit. It is so wonderful information. Will a tax cut shift the graph to the right? Photoshop Online Alternative is a perfect alternative to Photoshop(Photoshop Online). With photoshop alternative you can add filters, frames, text, layers and effects. Create an amazing photo collage, card, facebook cover, twitter cover, instagram images, youtube channel or design graphics. I wasn’t very well aware of the economic matters until now. However, no I am even more sure that I need a great CV to get into the economic filed. For these purposes I would like to connect with the top resume writers in NYC online. The sales tax on the consumer shifts the demand curve to the left, symbolizing a reduction in demand for the product because of the higher price.